"AAAAAYOOOOAAAAHOOH!" Beesting's whoop of joy sounded out from atop Ash�s back. Melody could practically see the gratified smirk on Ash�s face despite her own position; riding carrisack on Axehand, and several paces behind the younger pair. Axehand had lost ground in the race over the loose ground of the creek bed, while lighter, more nimble Ash maneuvered atop smaller stones his very big brother couldn�t risk tromping on while bearing another�s weight. But the end-point of the race was the old Split Tree, which sat across the creek and up a slight incline. It was a straight run, and Axehand�s strong legs and natural speed gave him the advantage. Melody let loose a triumphant howl of her own as her 'mount' closed the distance. At the base of the husk, the four elves shared congratulations and laughter. After some good-natured wrangling between the brothers, the race was declared a draw. �So what now?� Melody asked, looking expectantly at Axehand. �It�s your turn to call a route and rule.� Ash had plotted the last race, doubtless setting the route the way he did to give himself an edge over the only other runner. Melody and Beesting had created their own obstacle-strewn routes before that. And before that they�d rolled toss-stones to determine the order. They�d been at it all night and past dawn, and even with the stone tossing every four races, she�d lost track of how many races they�d run. Melody groaned under a strained grin and sent, only half-jokingly, **If I�m going to do this, I�ll do it just the way you did! ** She shifted her arms, sending her burden sliding feet-first to the ground. Which got a laugh from the pair of witnesses. �Fair enough,� Axehand answered, his cocksure manner untouched. �If you�re set on being fair about things.� Melody stooped down to let Axehand take his seat, her arms locking around his legs. Beesting blinked, �Sure, why not?� She offered her arms to Ash. 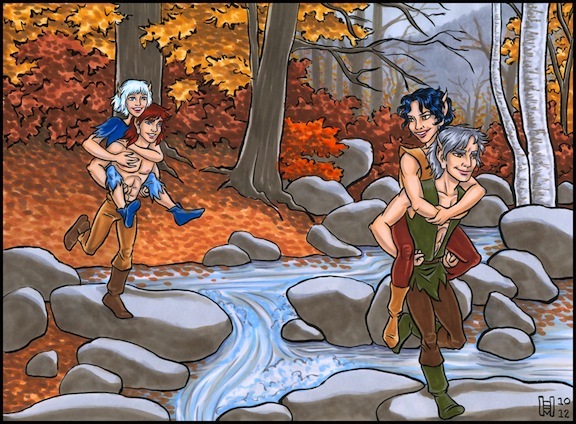 He accepted them, and off the she-elves went staggering down to the creek.